Some argue that Niagara-on-the-Lake is the prettiest town in Canada. It’s certainly one of the most interesting historically. Today, visitors from around the world come to enjoy the theatre of the Shaw Festival. They come to savour the wine in the vineyards — sometimes renting bicycles to tour the wineries. But winter activities in NOTL have been relatively scarce. That’s now changing. The town always had winter attractions for the history buff. As winter sets in, the townspeople hold a Candlelight Stroll through the heritage section. Some years, this coincides with December 10 — the date when a retreating American army burned the town to the ground during the War of 1812. As the site of the Fort George National Historic Site, the town hosts many events to remember past winters and the way of life of a town that was at the heart of historic events. The Friends of Fort George organize off-season events that range from Beefsteak Society dinners to annual Levees, where they they don’t “ring in the New Year” — rather, they detonate it to the sound of a Fort George gun. In 2017, ss a project for Canada’s 150th birthday, Parks Canada (proprietor of Fort George) teamed up with Vintage Hotels to create the Vintage-Parks Canada Skating Rink. It was popular from the outset, with thousands taking to the ice in the opening weeks of operation. An outdoor ice rink at Fort George makes an ideal location for a kilt skate, and the suggestion was put to the Friends of Fort George. The mandate of the Friends and of Parks Canada doesn’t encompass celebrating Scotland’s contribution to Canada with bare knees and ice, but they have certainly come forward with a wonderful event, to be inaugurated on January 5, 2019: a Regency Skating Party. 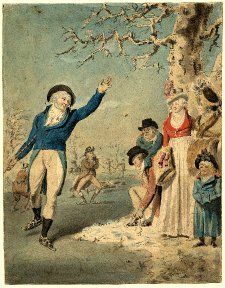 Two hundred years ago, skating was a popular winter activity among Britain’s upper classes. 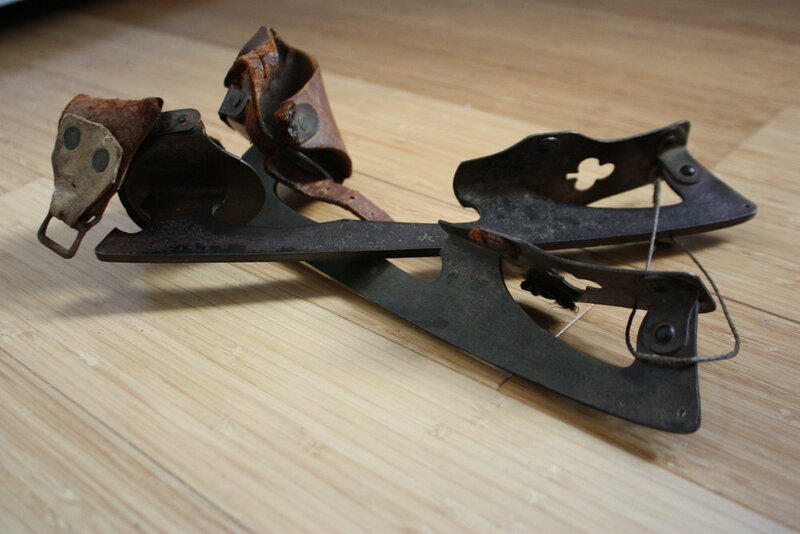 Skate blades were strapped to winter boots and and parties of winter revelers would gather on the frozen ponds and rivers of the United Kingdom. Were skating parties organized by the officers of the Fort George garrison and the wealthy merchants of the town? It seems likely, but I haven’t come across any references in my research for the Jake and Eli novels. Brothers at War, however, does begin with winter activity: a snowball fight between the garrison soldiers and the town children. But whether the Friends of Fort George are replicating an event that actually took place Niagara, the Regency Skating Party on January 5 is going to be fun for the whole family. The ice is open to the public from 10 a.m. until noon. The Regency Public Skate will take place from 1:00-4:30 p.m. with the ice reserved for Regency costumed skaters from 4:30-5:00, during which there will be a costume contest with prizes to be won. Fort George is also open to the public, The price of admission to the fort includes a carriage ride from the skating rink to the fort, hot beverages and cookies, and special demonstrations including musket firing. Adult admission to the fort is $11.70; seniors $10.05 There is no admission charge to the fort for those 17 and under. There’s no to anyone for skating on the Vintage-Parks Canada rink. Will there be Regency kilts among the costume contestants? The kilts of today have evolved greatly. The notion of a “clan tartan” was developed in the years following the time that the Friends of Fort George will replicate. But there are certainly kilt skate aficionados who take to the ice in period costume — and hopefully they’ll join the fun at Fort George. Niagara-on-the-Lake certainly has strong Scottish roots. Many of the soldiers of the garrison and prominent people of the 1812 town had come from Scotland. Some have provided models for the characters in the Jake and Eli books, including Dominie Burns, Dr. Kerr, John Norton and William Dunwoody Sr.
We hope that many Scots-at-heart and kilt skate enthusiasts will go to the prettiest town in Canada on January 5 and join the Regency Skating Party. For further information, check our Events page.